There is a most interesting article from Fr Z yesterday, referring to a CNS story quoting an article by Bishop Athanasius Schneider of Karaganda, Kazakhstan in L'Osservatore Romano. Sorry that it is two steps removed: the Italian version of L'Osservatore only stays up on the day of publication and I have been unable to check another article that was referred to in a news service because of this. Perhaps the new team at L'Osservatore will consider running a full web service...? It would certainly enhance their great service to the Church. Bishop Schneider's article is presented as a "historical-liturgical note". He argues in favour of the practice of kneeling and receiving Holy Communion on the tongue. It is significant that L'Osservatore should publish an article in this vein. 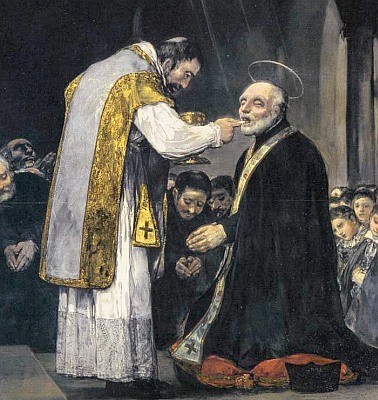 For many years, the subject has been off-limits: communion on the hand has been treated as though it were entirely of the same status as receiving communion on the tongue. I previously wrote a reminder about Memoriale Domini in response to some comments regarding Archbishop Ranjith's November interview in which he suggested that communion in the hand had led to "a certain loss of faith." It seems that it is now acceptable to question the almost universal acceptance of communion in the hand as being something either good or completely neutral. "Wouldn't it correspond better to the deepest reality and truth about the consecrated bread if even today the faithful would kneel on the ground to receive it, opening their mouths like the prophet receiving the word of God and allowing themselves to be nourished like a child?" The saint receiving Holy Communion in the photo above is St Joseph Calasanctius. 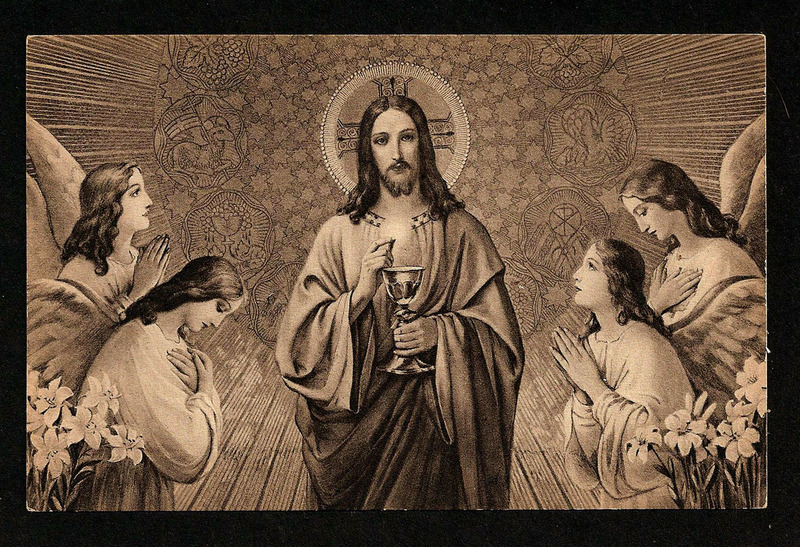 Here is another image which reminds us of the holiness of the act of receiving Communion. This was taken from the blog Holy Cards for your Inspiration which I recommend to you.